Using a gluten free meal plan doesn’t mean saying goodbye to comfort food. 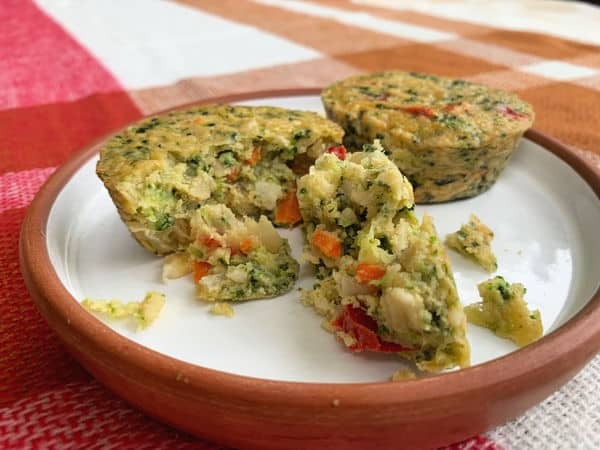 Check out these tasty and easy gluten free meals. I love comfort food, plain and simple. And for me, that means lots and lots of breads and pastas that fill my belly and keep me warm. I recently started a new eating plan that asked me to eliminate gluten and dairy for a season, which initially made me really nervous. But I committed and now that we have a few go-to ideas, I’m kind of loving it! If you are living a gluten free lifestyle, you already know finding tasty alternatives to wheat can be a challenge. Thankfully, brands are listening! I was recently sent several different items to try and I truly love them all. What I’m learning is when I add a few easy gluten free meals to the rotation, it really doesn’t change the way we eat much at all. If you’re like me, spaghetti night is a staple in the meal plan rotation. It’s simple, it’s easy and usually the whole family loves it. 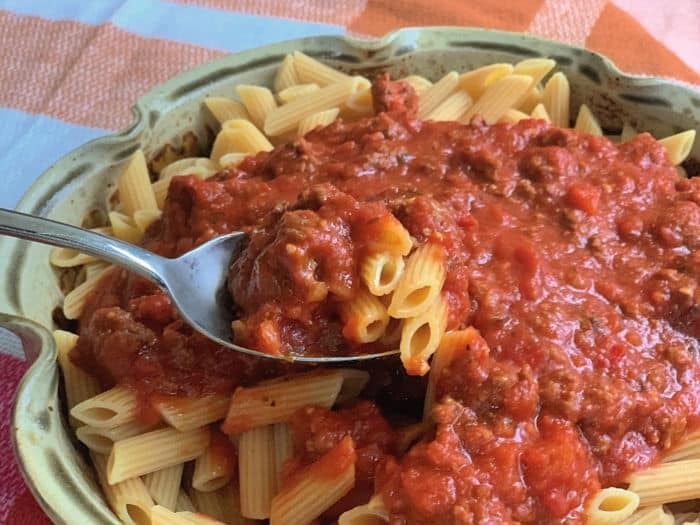 Throw in a sauce like the new RAGÚ® Simply Chunky Marinara Pasta Sauce and you’re already winning because this sauce has no added sugar and 100% olive oil. My family already loved the flavor of RAGÚ pasta sauce so I was looking forward to trying this. The new sauce is exactly what I’m looking for in my quest to watch our sugar intake and steer clear of ingredients we don’t need. Just stir in some freshly cooked ground beef and we’re off to the comfort food races. But what about the pasta? That’s the real kicker when it comes to gluten, right? I’ve tried different types of gluten free pasta and believe me when I say they are not created equal. I had just started my new eating plan when this box arrived and it was like Christmas! Can you guess the ingredients on this Cali’flour Cauliflower & Yellow Lentil Penne? If you said yellow lentil and cauliflower, you nailed it! Two ingredients, y’all. And it is every bit as delicious as any gluten filled pasta I’ve ever had. I am SO excited about this. In fact, I’m adding the recipe with calorie counts and macros below so you can see why. I mean, I love spaghetti night. But I never really considered it to be healthy until now. Looking for a gluten-free and low carb cauliflouwer pizza night option? 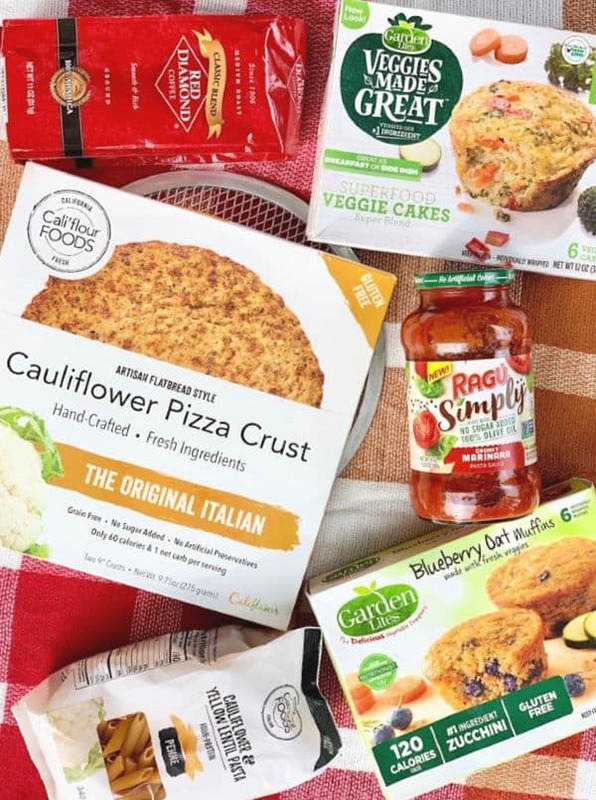 Grab an Original Italian Cauliflower Pizza Crust from Cali’flour and make this easy mix & match pizza recipe. 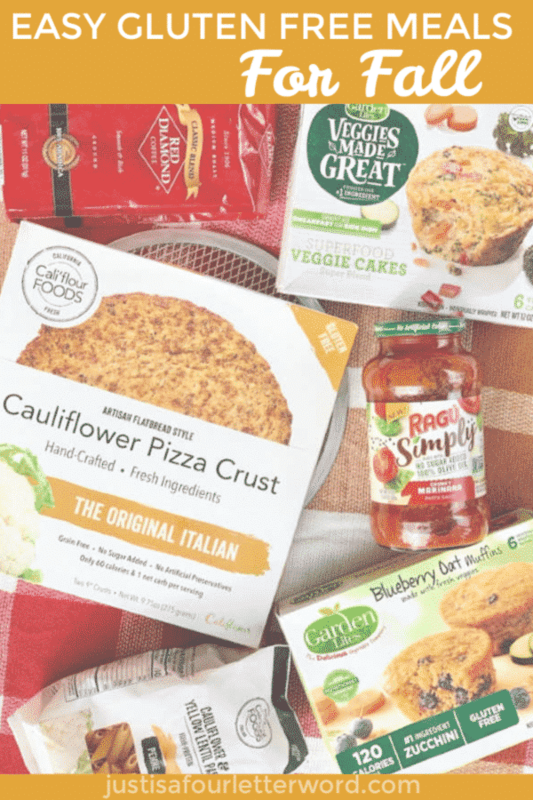 My hope is that more local stores will start carrying Cali’flour products. But until then, your best bet is to get them online and be sure to use this discount code. Use code NOFUSSFOODS for 15% off your online order (plus free shipping) Cannot be combined with other discount codes or promos. No expiration date -however the coupon code is only good for one use per customer. “You can take my coffee from my cold dead hands”, is something I might say before I’ve had my morning cup (or three) of coffee. I’m very serious about my coffee, but I wouldn’t say I’m a serious coffee drinker. I don’t need anything fancy. I drink my coffee black and I make it at home every day. And of course, coffee is gluten free. I was sent an 11 oz. bag of Red Diamond Classic Blend Ground Coffee to try and was not disappointed. I’m a fan of Arabica beans and this coffee has a nice smooth flavor. I tend to drink more than one cup in the mornings, so I don’t want anything bitter or leaving a weird taste in my mouth. Don’t mess with mama’s coffee! 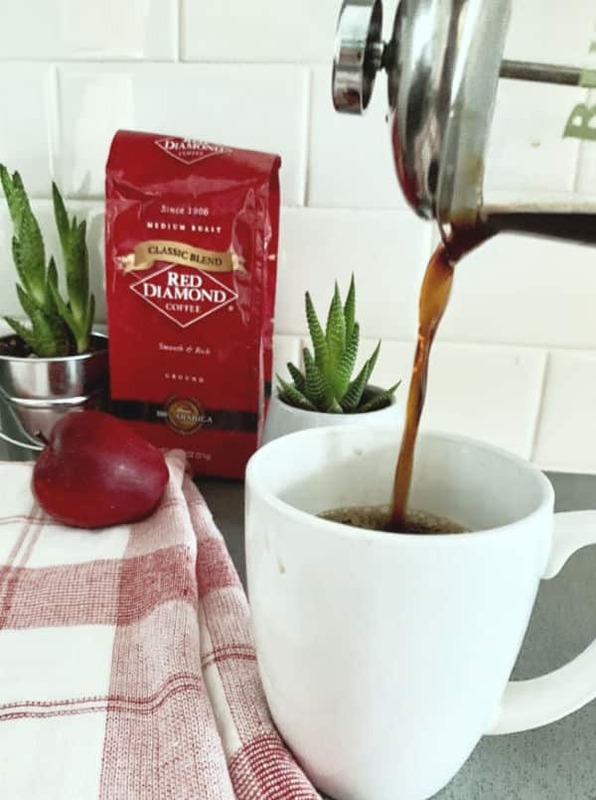 Red Diamond coffee beans are grown in Central and South America at high altitudes. Then they are hand-picked, sun-dried and roasted in small batches. Check out their website for your local stores or save 20% off of your Red Diamond coffee purchase until midnight Central Time on 12/31/18 with the code coffee2018 when you purchase on their website. Nothing goes with coffee like a delicious muffin. When I started eliminating gluten, I thought I would be saying goodbye to muffins forever. But now I don’t have to! When I’m trying to be healthy, I tend to steer clear of the freezer section and all the temptations it contains. 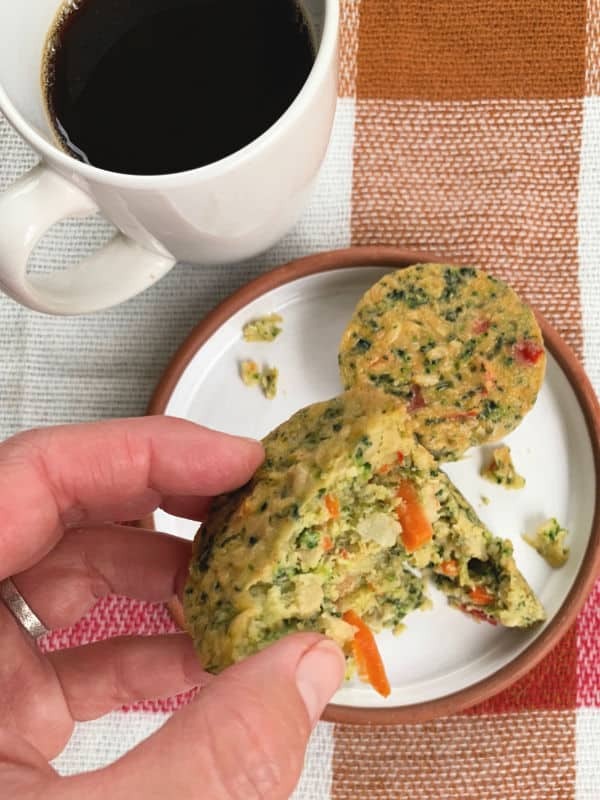 But don’t skip these Garden Lites veggie muffins! I admit that I was skeptical at first when I tried these, but I am converted. Heat them in the microwave for 30 seconds and you’re on your way. 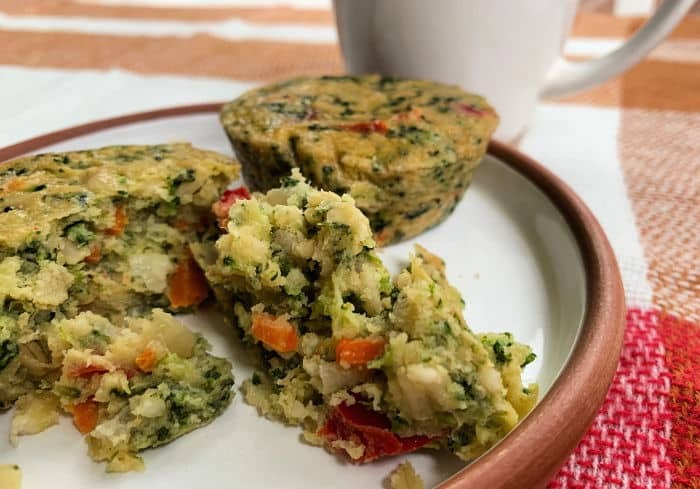 Choose among several options including Garden Lites Blueberry Muffins made with zucchini as the primary ingredient or swap sweet for savory with Garden Lites Superfood Veggie Cakes. I was so impressed with the real veggies just popping out of these tasty treats. The blueberry muffins are my perfect snack in the mornings or to add in my kids’ lunchbox and I can’t wait to serve the veggie cakes with our family favorite Butternut Squash soup recipe. Use the code BABBLE20 for 20% off your online order. I’m only a few weeks into my gluten free journey and I have been really surprised at how manageable it is. 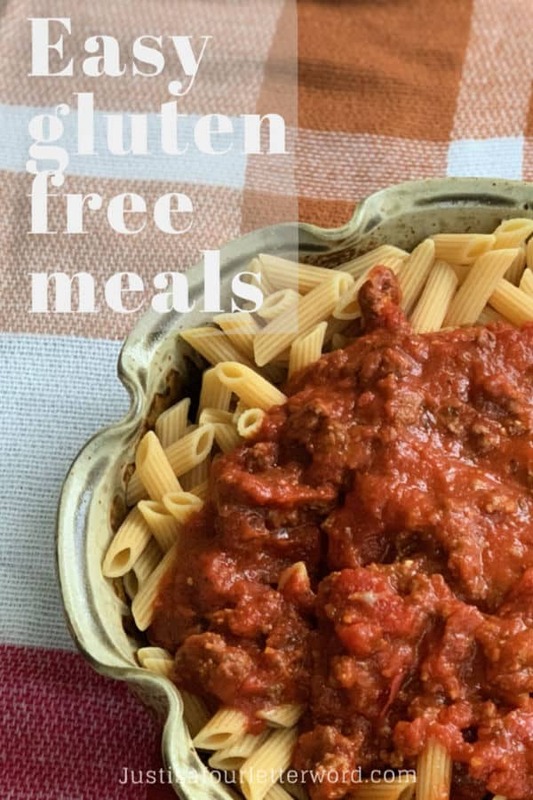 I will continue to share tasty recipes as I find them and while I’m thankful that I may not have to be gluten free forever, it’s nice to know I have options! 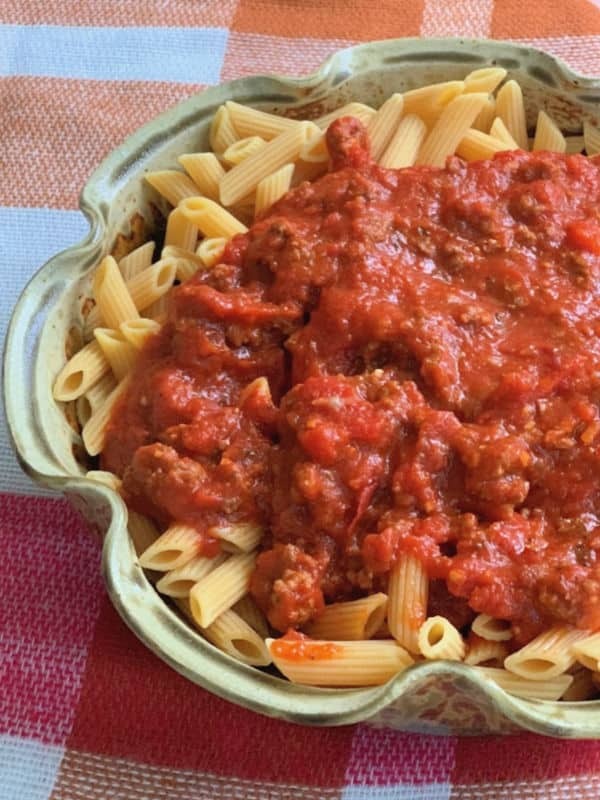 Take this classic comfort food and make it gluten free! Yes, really. 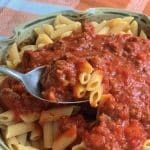 You can enjoy pasta with meat sauce and skip the gluten.